One of the first things we discovered when we moved here is that fast food doesn't exist in the same way it does in the States. Rather than getting fast food from a pizza place or a Chinese place, most strictly "take out" places here have everything all-in-one. You'll find burgers next to tacos next to Indian food, all on the same menu, and sadly, none of it's very good from our experience so far. There is one fast food, however, that I've come to love: döner. My favorite döner kebab at Nur Kebap & Pizza. The döner kebab consists of meat carved from a giant spit of various kinds of pressed meat, usually lamb and beef. The meat is shaved off and added to a pita with various toppings. I've heard various stories about the döner being Turkish and about it being created by a German Turk, thus making it part of German cuisine. Either way, it's good, and I've seen döner shops in several countries around Europe. This isn't health food in the least, and I've actually heard that some kebabs can have upwards of 1,000 calories per sandwich (yikes!). But the point is that it's good, it's fast, it's ridiculously cheap (3,5€/$4.8 per sandwich) for the amount of food you get, and it hits the spot, especially when you have a hangover. (Think of it as the European answer to a cheesesteak or burger after a long night of drinking.) The döner kebab also seems to be a common lunch choice for many students and busy office workers who only have a short lunch break. We've tried about five or six different kebab places in Stuttgart, but so far my favorite is one that's just down the street from our house. The place was called Dyako Kebap & Pizza, but they recently changed the name (not the cook, thankfully) to Nur Kebap & Pizza. So what sets this place above the rest? Firstly, the meat is juicy, tender, and full of flavor. I've had dry and bland kebab meat before at other restaurants. I don't know what combination of meat is in Nur's recipe, but it has just the right balance of salt and fatty flavored meatiness. The second most import ingredient is the pita. The chefs at Nur always pull out a new ball of dough and heat up the pita in the oven fresh with each order. This means that you do have to wait a few extra minutes for your order, making the wait time slower at Nur than at other döner shops we've been to, but the wait is totally worth it for the soft inside and slightly crispy outside of their pitas. Some of the places we've tried, including one new shop that claimed to have "gourmet" kebabs, serve their döner on what appear to be flat hamburger buns. The taste just isn't the same. 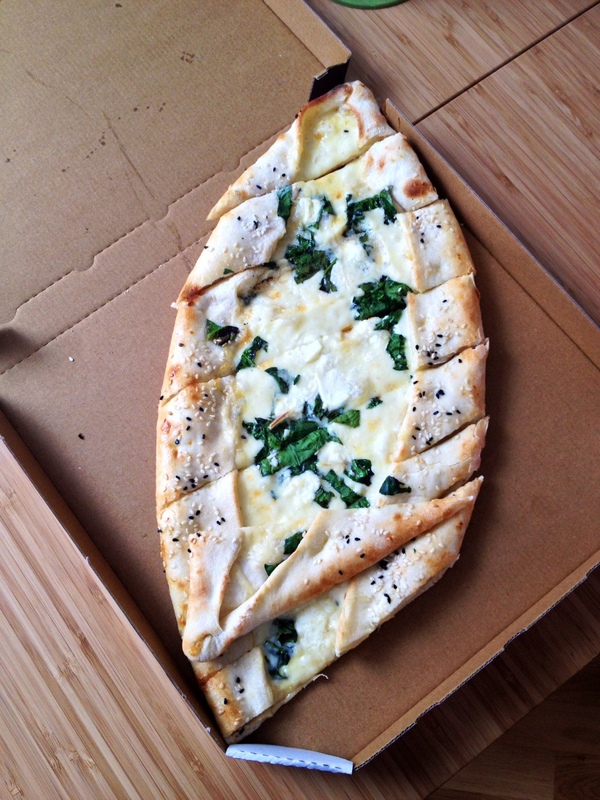 Pide with spinach, cheese, and egg. Nur also knows how to add the right toppings, from lettuce and tomatoes to red cabbage and yogurt sauce. I always ask for mine mit alles and scharf (spicy) with red pepper flakes on top. Finally, I like this particular stand because they have lots of variety on their menu, and seem to do each dish equally as well. Matt often orders the yufka kebab (same meat and toppings inside of a wrap), and we often order the pide with egg, spinach, and cheese. Again, you can't beat the freshness of the bread in their pides. Tonight Matt also tried their Iskender Teller, which is döner meat cooked in a tomato sauce over toasted bits of pita bread. The sauce had a nice rich flavor that complemented the meat. In fact, you can order their döner kebab as a teller and get the meat and toppings over fries or over a salad for a slightly healthier alternative. Nur also makes pretty good french fries, which is one of my comfort food favorites. The restaurant is located just off of the Mitte (central Stuttgart) along Charlottenstraße. The shop front isn't much to look at, but you're there for the food anyway. It's also just across from the Olgaeck U-bahn stop, so it's pretty easy to get to. They do have both outdoor and indoor seating, and they've recently remodeled the interior to make it look a bit nicer, but we've never actually eaten inside the tiny shop. We've always gotten our food to go. Nur Kebap & Pizza just off of Charlottenstraße. Nur's new menu with plenty of pictures. In terms of accessibility for non-native speakers, I've never had to speak English with the staff because they've always understood my simple orders by reading off the menu. I get the impression that most of the men who work there aren't native English speakers themselves, which may explain why they're all extra patient and helpful if you stumble over your German, like me. It also helps that the newly remodeled interior menu has pictures of just about all of their dishes, so you know exactly what it is that you're ordering. I definitely recommend you check out Nur when you have your next kebab craving, and let me know what you think. Otherwise, do you have a favorite kebab shop in Stuttgart or one that we should try? Let me know in the comments below!